A great small storage unit for limited spaces. 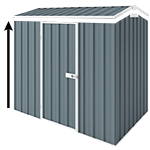 This garden shed is ideal to store gardening or sporting equipment in smaller backyards or unit complexes. A very popular garden shed for metro Sydney, Brisbane and Melbourne. You can get a number of accessories with this spacesaver unit, including Flooring Kit (that will eliminate the need for a concrete slab), Anchor Kit, Cyclone kit and more. Shed is engineered to withstand cyclonic conditions of up to 147km/hr winds (N2).